Muslim Egyptian Mobile Apps Publisher | Bassem Elhawary: Happy Birthday SMS, RIP Soon ? BTW, I don't know why on earth they sent "Merry Christmas" on December 3rd!! 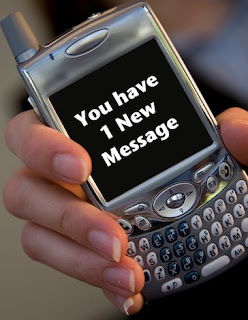 Anyway, Happy birthday dear SMS, but I'm afraid it won't be long until we say "RIP SMS!". Why is SMS in danger ? With the rise of the smart phones powered by iOS, Android and Windows Phone many users found cool alternatives to SMS that use the same identifier which is their mobile number. So, If you're using a smart phone and you're a subscriber of an internet plan then you most probably won't need to send SMS to many people. Smart phones have been a choice for many users even in emerging markets and developing countries. Cheap Android powered phones made it easier for the users to have a smart phone. Even the feature phones got smarter, take Nokia's Asha as an example. Now with a $150 phone you have a mobile apps store in which you can find many alternatives to SMS that will cose you nothing compared to the high price you pay for every single SMS. You can chat all day on Whatsapp and end the day paying less than the price of a single SMS. Will operators allow SMS to die ? I believe yes! .. But they're gonna replace it with a very cool thing. You know what's the most important feature of the SMS ? .. It's interoperable. It just works, whatever your operator, your mobile or your language. Whatsapp user won't be able to chat with somebody who doesn't have Whatsapp installed on his phone. But with SMS you don't think whether the other side has SMS capable mobile phone or not, because all mobile phones are SMS capable. So, What's the mobile operators' reply to Whatsapp ? Did you hear about joyn ? .. joyn is an initiative that will provide smart services like chatting, file transfer, video calls out of the box across all operators. What makes joyn powerful is that it's based on a standard called the RCS standard. When it's fully deployed I believe that it will kill Whatsapp-like applications and will help mobile operators maintain the users who they retained along the past years. Will SMS die? .. will whatsapp win at the end? .. Will joyn take all of the cake from the rest of the players ? Let me know your opinion, just add a comment in the comments section below! That was quiet nice and informative. Thanks for such a good read.